The theme of “following the Party’s command” dominated China’s massive military parade held on July 30. On July 30, China held a massive military parade to commemorate China’s Army Day — marking the day the Communist Party of China (CPC) founded the People’s Liberation Army (PLA) in 1927 — for the first time, in celebration of the PLA’s 90th anniversary. Although China has conducted multiple military parades for various days, this parade is undoubtedly an unprecedented one to reaffirm the CPC’s absolute control over the army. The theme of “following the Party’s command” dominated the whole event. During the parade, as Xi Jinping, Chinese president, the current general secretary of the CPC, and chairman of the Central Military Commission, was driven past ranks of troops, the troops shouted out loudly: “[We] follow the Party’s command; [we] can win the battle; [we] have excellent behavior!” This is actually the newest goal and slogan for all the military to memorize and “following the Party’s command” is obviously the priority. 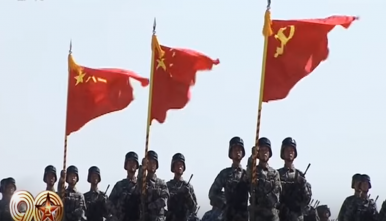 The most striking and iconic signal on the day was that — as shown in the picture — the banner team held the flags so that the Party’s flag went right in the front of Chinese national flag, and the national flag was in front of the army’s flag. The next day, the picture depicting that the Party’s flag leading the way was also widely published on the front page of most Chinese national media websites. In addition to the theme of “following the Party’s command,” “following Chairman Xi” was another significant agenda of the parade. As The Diplomat noted regarding the Hong Kong’s military parade, held on June 30, the previous tradition in such military parades was that the CMC chairman would shout “Greetings, comrades!” to the troops and the troops would shout “Greetings, leader!” in return. Yet at the Hong Kong military parade, the protocol was slightly changed, rather unprecedentedly. Instead of shouting “Greetings, leader!” the comrades shouted “Greetings, chairman!” to Xi. At that time, it was still unclear if the unusual change of wording was specifically designed for the Hong Kong parade or not. Now we know that it’s a more long-term change, as the troops in the Army Day Parade also shouted “Greetings, chairman!” to Xi. Charlotte Gao holds a MA degree in Asian Studies. Her research interests center around East Asian topics. She has worked in the past as a news editor, reporter, and writer for multiple traditional, online, and new media outlets. What Will Be Added to the Chinese Communist Party’s Constitution? The CCP is set to revise its constitution and Xi Jinping’s political thoughts are a barometer of what will be included.